With substantial roots, sturdy interwoven trunks, and a crown of hearty green foliage, it’s easy to see why this special bonsai tree has been said to embody strength. A fitting gift for any occasion, especially get well or to show your support, the 6-year-old tree arrives perfectly manicured and planted inside a traditional bonsai pot topped with a bed of moss. Strong indeed, it will thrive indoors in a variety of settings and light levels. 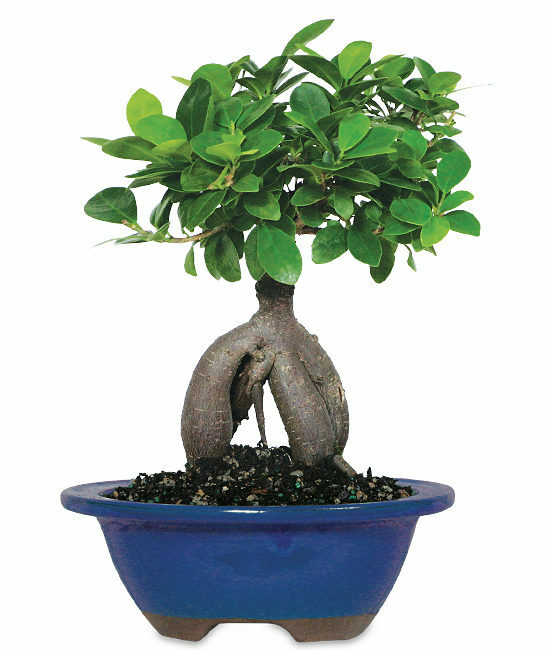 Your bonsai is hearty in nature and is easy-to-care-for in an indoor setting. Your bonsai will enjoy warm, direct sunlight. Avoid placing the tree close to a heat source or drafty windows. Water when the soil is dry. Watering can take place every 2-3 weeks in the Spring and Summer months and can lessen during the Fall and Winter months. Pour about a 1/3 of a cup of water at the base of the tree. Do not allow water to pool which can cause root rot to develop. It should soak up reasonably quickly. Fertilize using a slow release organic feed. Most shaping can be done by pruning.